As you are likely to know, Darwin’s detention centres have now closed. You might be asking what happens to DASSAN now? We’ve been asking ourselves the same thing. Since its inception, DASSAN’s role has been primarily to advocate for and support the large numbers of people that have been detained in detention centres in the Darwin region. Given our committed volunteer base and the continuing needs of people seeking asylum, we have done some scoping work and have decided to refocus on supporting those asylum seekers living in the community. There are currently around 100 people seeking asylum living in Darwin who are provided with minimal support. Some of these people receive no support from government and manage to live on a $50 voucher granted by a welfare organisation. Others are ineligible for casework assistance from funded agencies and struggle with basic living skills like reading letters and navigating Medicare. All need assistance to understand their migration process and seek legal help. DASSAN will soon pilot a program aimed at advocating for asylum seekers living in the Darwin community and providing support to them. As we have further information we will keep you updated. We need your help to get this program off the ground and provide desperately-needed support to these vulnerable people in our community. DASSAN receives no regular funding and relies on donations – without an income, this program can’t happen. Please click here to make a monthly tax-deductible donation to DASSAN. Tash, our current DASSAN employee, has done a brilliant job in advocating for people inside detention but sadly will leave us in September. 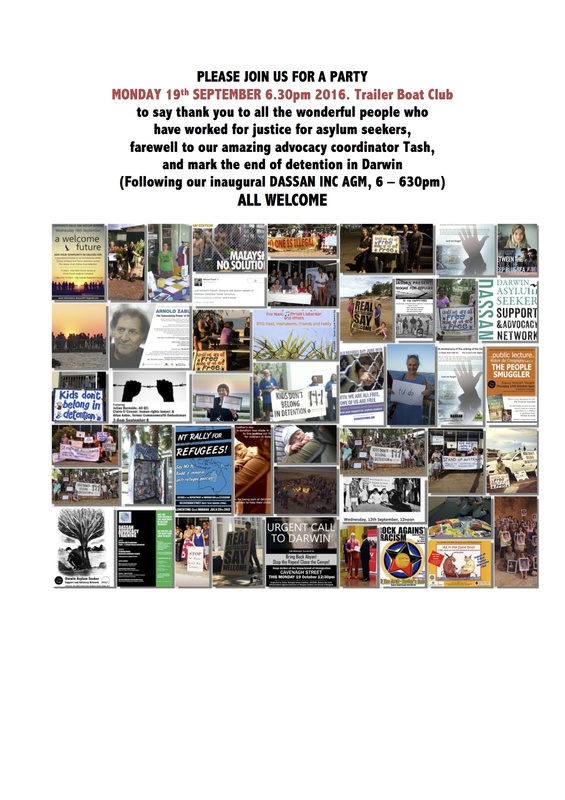 Please join us on Monday September 19th for our inaugural AGM – at the Trailer Boat Club at 6pm – to be followed by a party to farewell Tash, mark the end of detention in Darwin and thank everyone for all the amazing work they have done. See the invitation for more details.. It was wonderful to gather with 250 people in a circle of silence on Sunday as we stood together for justice. “For those of us who have seen this suffering with our own eyes, it is burned into our retinas. We wake up crying and sweating in the night. Sometimes we simply burst into tears for no reason. The faces and voices of people we have left behind to suffer are in our minds every waking moment. We cannot, and we will not, forget them. And we beg you not to rest until they are safe. Please – stand together with us until we Close the Camps, and our government agrees to Bring Them Here”. While we support the call for a Royal Commission, we already know what harm is being done, and what we need to do right now to stop it – Please sign the Refugee Council’s petition to Bring Them Here immediately.